Dr. Devin Brown will speak on C.S. 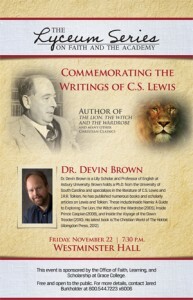 Lewis at the upcoming Lyceum Series Lecture at Grace College. The upcoming Lyceum Lecture at Grace College, Winona Lake, Ind., will commemorate the 50th anniversary of the death of the English writer, C.S. Lewis. Held at 7:30 p.m., Friday, November 22, 2013, in Westminster Hall, the speaker will be Dr. Devin Brown, a Lilly Scholar and Professor of English at Asbury University. Brown, who holds a Ph.D. from the University of South Carolina and specializes in the literature of C.S. Lewis and J.R.R. Tolkien, has published numerous books and scholarly articles on Lewis and Tolkien. These include Inside Narnia: A Guide to Exploring The Lion, the Witch and the Wardrobe(2005), Inside Prince Caspian (2008), and Inside the Voyage of the Dawn Treader (2010). His latest book is The Christian World of The Hobbit (Abingdon Press, 2012). The Lyceum Series on Faith and the Academy is a lecture series that draws inspiration both from the history of Grace College and Winona Lake itself. During America’s Progressive Era at the turn of the twentieth century, Winona Lake’s Chatauqua tradition attracted lectures and presentations from high-profile speakers who brought high culture to small-town America. Notable figures included three-time Democratic Presidential candidate William Jennings Bryan, humorist Will Rogers, and famous preacher Russell Conwell. Looking for continuity with this valuable heritage, Grace College established the American Lyceum Lecture Series, which showcased conservative voices such as Allan Keyes and Michael Reagan. Under the newly formed Office of Faith, Learning & Scholarship, the recently renamed Lyceum Series on Faith and the Academy reflects Winona Lake’s tradition of cultural engagement and Grace College’s commitment to vibrant conversation on issues related to the intersection of Christian faith and academics.